Is Officer Safety Training broken? If so, is there a way to fix it? Early in my career, I was escorted into a room at a national-level agency and shown a single, security-restricted copy of the ‘Self-Defence’ training programme which was being taught to at-risk staff. My sense of anticipation before opening that document caused my heart to race. You can only imagine my disappointment, however, when I discovered that the ‘security restricted’ material was no better than was available to anyone who can get their hands on the still on-sale 1960s-era Japanese Karate books on the Martial Arts shelf at your local bookstore! The truth is, there are probably as many different approaches and opinions about the physical management of confrontations as there are people interested in them. With this as a starting point, I want to tell you about some of my recent insights into police services’ officer safety training in the UK. If what follows is not news to you, then forgive my wordiness, but ‘watch to the end’ to see what I think we can do about it. There is an assault on a police officer roughly every 22 minutes in the UK. When such an assault happens, officers rely on their Officer Safety Training (OST) to survive and resolve the incident. In this sense it has some similarities to the Breakaway training our NHS clinical staff receive, and the self-defence training that our Prison Service staff receive, in that its purpose is to prepare at-risk workers for the occupational use of force in their workplace. When the training includes the control and restraint of violently resisting subjects, it may be referred to as Arrest and Self-Defence Skills (ASDS). I also learned that although most police officers attend officer safety training on an annual basis, the nature, design, content, delivery and crucially the effectiveness of this training is not very well understood. 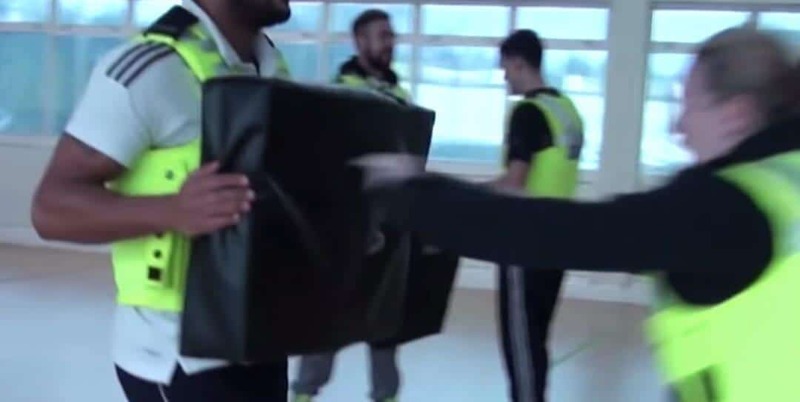 Research into the effectiveness of officer safety training is sparse, however in recent years those who have cast their eyes on this part of police training have been looking at it from a few new and different angles. Let’s pause for a moment to consider the importance of OST and ASDS training in terms of the police officer, the police services and the public they serve. A quick Google search for police use of force will render story after story of tragic incidents where often vulnerable people have died in police custody where the arrest, control and restraint methods used during their final moments are put under intense scrutiny. I always look at these incidents as multiple tragedies: the officers involved face personal, legal, emotional and organisational stress in addition to the loss, heart-ache, grief and frustration of the relatives of those who lose their lives. Arguably, beyond the cost and return on investment of providing this training from an organisational point of view, officers and the public deserve to have confidence that OST and ASDS training is achieving its aims: greater safety, less risk and consistency in the appropriate use of force. In 2014 I met researcher and coaching expert Prof. Chris Cushion, who has for thirty years specialised in coaching and trainer-education. We started a conversation about the efficacy of using a training methodology in which the tactics were based on behavioural, observable effects of violence and the instinctive responses involved in kinetic high-stress violent encounters. We had many conversations and spent more than a few hours in the training hall exploring the issues. Chris was already experienced in martial arts prior to turning his professional eye on OST and ASDS. One of his first hypotheses that caught my eye was that, while so many of us trainers are wrapped up in the merits of individual tactics for physical intervention, personal safety and restraint, perhaps as a sector we were missing something that he believed that was glaringly obvious. Perhaps, he said, it was HOW we taught and not what we taught that would make the difference to our learners when, while single-crewed and responding to a call out, they needed to perform tactics robustly and at a high level of skill, with very little notice or preparation, in the context of their working day. We have collaborated extensively to address what may be one of the biggest problems in our industry (learner performance under real-world pressure), while also pointing out the fact that maybe, just maybe, there were already evidence-based and well researched models from the field of coaching, learning and performance which we could lean on to improve the results we were getting with our learners. While I set out on a professional journey to change the way I and my team of trainers at Dynamis would plan and design and deliver our training in the education, health, social care, hospital security sectors based on his advice, Chris focused his attention on what was happening in the police services and attempted to discover how officer safety training was being delivered to arguably the most at-risk group of workers in the UK in terms of physical assault risk. His feeling is that the degree of contextualisation, the practice design and the coaching behaviours which shape the learning environment has a large effect on learning, real world performance and therefore true officer safety outcomes. The results of his study into officer safety training at one police service were published in a Journal of Policing article, published by Oxford University press. A key issue that he noted was that the trainers themselves had low self-awareness, which happens to be (I learned) extremely common among coaches across the entire domain of coaching and instruction. What this means is that coaching and training staff may have certain beliefs about the effectiveness of the program they are teaching which do not match the reported experiences of their learners or the confidence of those learners to persevere in high-risk encounters. There were many other notable points made in the study. Overall, what the study suggests is that the learners – our frontline police officers – who need to use and rely on their personal safety training on a daily basis, may have a low level of confidence that the training they are receiving is effective, and crucially it is possible that their trainers may have little awareness of this. I recently sat down with Prof. Chris Cushion to talk about his research into officer safety training and hear his insights into the importance of coaching behaviours and the learning environment which coaches create to support learning.